Lest you think, as some of my friends have, that I sleep in a suit (thanks Pam! ), I thought I’d set the record straight. I’ve written before about my love of the camelhair polo coat. I find it to be very stylish and as comfortable to wear as a bathrobe. Which is why it makes the perfect topcoat for a blustery and cold day of running errands after cleaning house. I first saw this look on a kid I taught to fence in college. He had to be the best dressed 19 year old on campus that day. Or at The Food Lion, anyway. Black cashmere turtleneck sweater. Levi’s bluejeans. Johnston & Murphy brown suede chukka boot. Brown leather gloves with cadet fingers. Jawbone Blutooth device which I forgot to take off for the photo (I was walking out the door.) Silly communications thing aside, this combination works equally well on women as a casual, comfortable and not completely undone look. 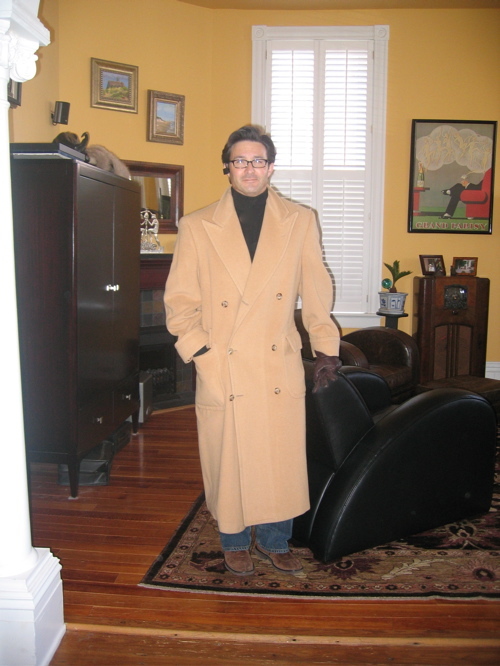 This entry was posted in Elegantology and tagged camelhair, cartoons, cashmere turtleneck, Jawbone, Pam Murphy, polo coat. Bookmark the permalink. 13 Responses to Polo(coats) Anyone? Yes I have that coat too! I have that same coat in three different lengths. I love it! Just take it off carefully, wrap it in tissue, and send it to me. I promise to take good care of it. That is a favorite uniform for me in wintertime as well. Only the coat’s a bit shorter. Just bought a new camelhair last week. Might wear it today as it is cold here. I’m so relieved you have blue jeans. Wait!!!!!! Why has no one mentioned how HANDSOME you are???? Come on people – this face belongs on the cover of GQ! Oh, I had 2 camelhair coats that I wore til threadbare, so you inspire me to purchase a new one – There is something about camelhair and elegance, especially with blue jeans. I agree with Joni- Sartorialist list…..anyone listening? Hooray! I’m glad to see that camelhair has its fans. I was stopped at the grocery store by an older gentleman (now clad in Gore-tex®) who told me that he had had one, too. Worn it until it fell apart. Mine is going on 15 years old now and so far, so good. I like the extreme length and fullness of the DB, although I once had a singlebreasted one that was cut a bit slimmer, though just as long. You really can’t go wrong. Ms. Webb and Mrs. PvE, thank you. I’m blushing. I have only posted my full photos in response to a reader request in order to gauge the effect of my clothing choices on my colouring. I am high contrast, or was I am mellowing in my middle years as I turn more grey. I love the lenght! Where did you find that coat? I am having a hard time find one of that lenght. The best I can do is find a 44 long have the sleeves altered. Any ideas? Hello Mr. Gilbert. The coat is at least 15 years old. They were making things longer and with more drape then. You may have hit on the best solution. Depending on the material you want, made-to-measure is another option, although it would run you over a thousand dollars for camelhair, I’m sure. Or yo may search eBay for a used one and hit on a good find, Just know your sizes. I love your site, I get loads of interesting takes on the good life from you, but dude take the bluetooth out of your ear. Bluetooth is never elegant even when it’s functional while driving, I’ve always preferred a simple earphone. Hello David, thanks for visiting and for the kind comments. Do you have a preferred earphone? I dislike the wires that run to the phone as I am an active driver and drive a stick. So far the jawbone has been the best answer and usually gets stuck in a pocket or left in the car. Except on those days when I forget. I’m always in the market for a more elegant solution.